Today, the trend is to hide our complex media electronics away. Make everything invisible as possible. Build the TV set into the wall; put speakers in the ceiling. Hide the electronics in a closet and control everything through a small remote, a smartphone, or by voice. In 1937, though, people were proud of their investment in technology, and didn’t hide it. The bigger the radio, the more tubes it had and the more stations that could be heard. The larger the set, the bigger the speaker and the better the sound. 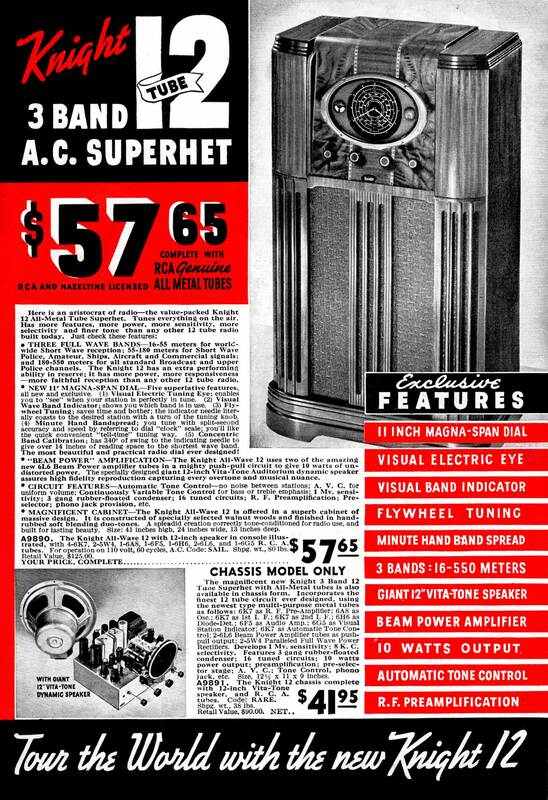 So in 1937, you didn’t make your radio blend in, you showed it off. This was Allied Radio’s top-of-the-line radio receiver of 1937, and isn’t it gorgeous? “Constructed of specially selected walnut woods and finished in hand-rubbed soft blending duo-tones,” it’s a sophisticated, streamlined moderne beauty. Worth clicking on the picture to see the details and read the rapturous tech-heavy copy. Knight radios were Allied’s own house brand. Other companies like Sparton, Philco, and RCA made even more beautiful sets. That $57 price tag would be the equivalent of $1000 today. 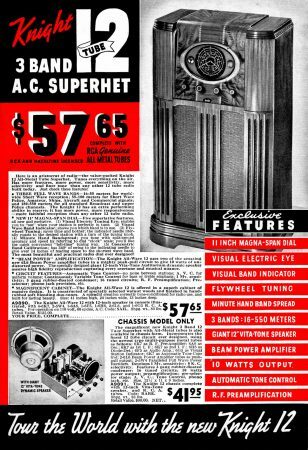 In 1937 Allied Radio was a company very much like RadioShack selling all manner of electronic devices. (We’ve considered their “diagnomoscope” earlier.) Actually, Radio Shack also existed in 1937, and these two companies two merged in 1971. Radioshackhas since gone to the great electronics recycler in the sky, but Allied actually still sells electronic components – nothing as pretty as this, though. Next Next post: Everything new is old again.